I kind of got away with that title there, but to be fair, whenever I see apples involved in literature, I immediately think of the tale of Snow White. 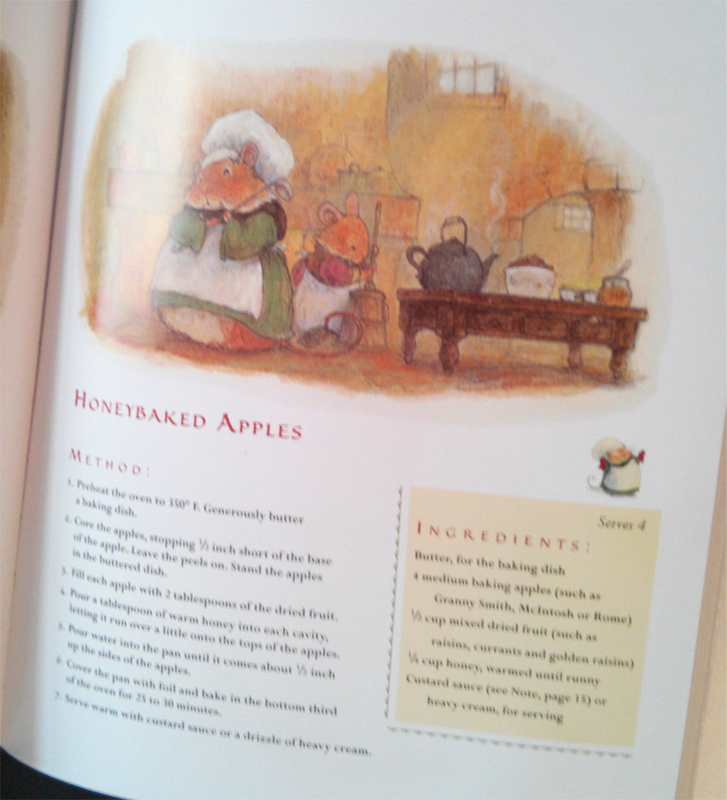 It’s not even my favorite tale by a mile, but I will admit that some of the retellings I’ve read do bring about the need to bake something with apples inside. Winter, I’m talking about you specifically. And yes, okay, so most apple covers don’t necessarily mean Snow White. I mean, unless you can give me a really good argument that says Twilight is a metaphor for the story of a crazed queen and her attempts to kill her more beautiful stepdaughter (but wait, wasn’t Kristen Stewart a star on both so maybe there’s the connection…argh, I’m digressing), then yeah, apple covers don’t mean Snow White. Buuut there’s got to be an appeal to apples, right? Because poor, silly Snow likes apples. Winter happens to love ’em especially when sprinkled and baked in with cinnamon. And honestly, I love baking with apples when I can. So there you have it. Apples. Are. Awesome. Say hello to the most scrumptious bready thing ever! 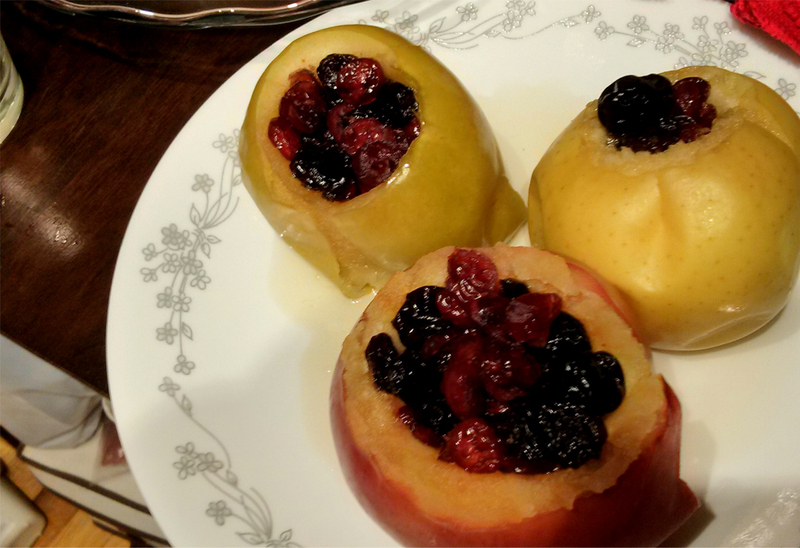 I’ve been saving a ton of apple-related recipes on my Pinterest to get back to later on, and eventually made my way to one I wanted to attempt. So while I procrastinated writing, well, anything (I’m sorry Meg and Tarma and and…yeah…), I baked something I could totally use as an excuse for being unproductive. Only I suppose I was productive, because I made bread. The recipe was pretty straightforward, and the glaze was standard milk, not cream, because I didn’t really have any cream handy. (And I wouldn’t go so far as to make glaze with cream anyway, not too fond of it being too thickly sweet). I also used three apples instead of two. And with my sister’s trusty new apple corer, peeling coring, and slicing those apples took mere seconds! Like the recipe suggested, I split the batter up into two. I lined my bread pan with parchment paper poured half the batter in, half the apple mixture in, and sprinkled that with a cinnamon-sugar mixture. Then rinse, repeat. I waited 45 minutes before checking up on the bread, and let it brown a bit more before pulling it out of the oven. Verdict: The bready middle was super moist and soft and so yum. It was a good call to split the batter so there’s plenty of apple to go around. There was a suggestion to add walnuts in, but with a brother who’s allergic to practically every nut in existence, I can safely say this recipe can do without. Total disclaimer: I have actually not read Brian Jacques’ Redwall series. So why do a Food and Fandom post on this series? Well, good question. I have a friend to blame for that. Lately she and I have met to do a bit of baking (and video gaming…), and she’s a big Redwall fan. So I guess in that respect, I couldn’t pass up doing something from a recipe book she owned, especially when it involved apples. Talk about something completely in-season! What I love about recipe books for fantasy books is that they’re extensions of the world and are in a way immersive of that particular world. To be honest, I feel I’m vicariously living in Westeros every time I do a recipe in A Feast of Ice and Fire (all I really need now are aurochs… *cough*), and I totally felt like I was sitting on the dwarf king’s throne whenever I think about making miniature Scones of Stone from Discworld. 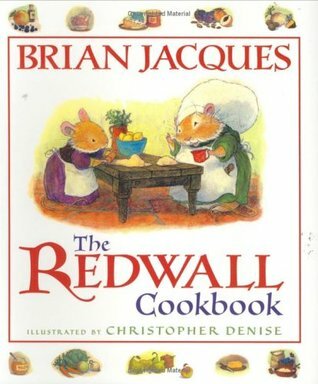 While I do not know the world of Redwall (actually, I’m vaguely familiar with it, because it is quite a popular series), I found it particularly adorable that there are recipes and foods that are transferable to our mortal plane. Baked apple recipes are super simple, and take practically less than a half hour to prep and bake, depending on how much you’re including in it. 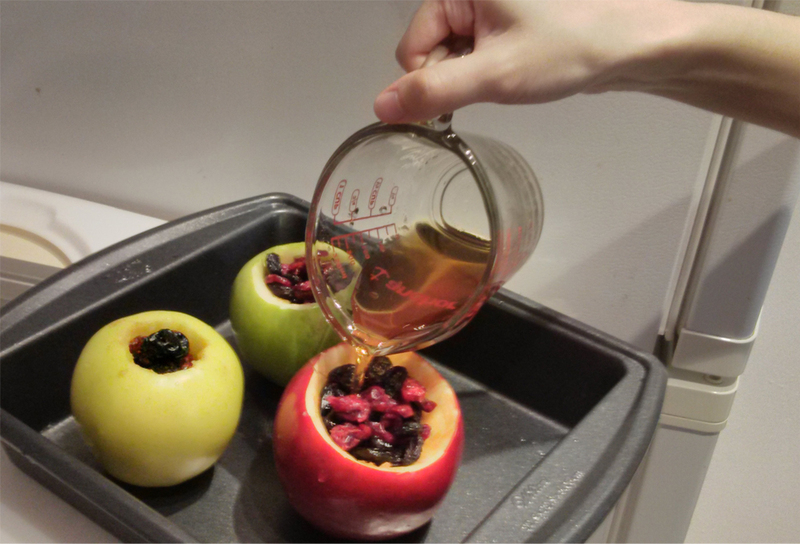 In this particular case, the cored apples are stuffed with fruits (we used an assortment of raisins, dried cranberries, and dried cherries), doused in honey, and put in a water bath for 20-25 minutes. Sounds delicious and simple, yeah? Because it really is just that simple. I will say this, though: it might be a good idea to get a corer, especially if you’re planning on coring a ton of apples and doing so regularly. It might be an especially safe route if you’re accident-prone like me and knives are not your friend. I think the only reason why the prepping took a big longer for this recipe was because my friend had to run around looking for a Band-Aid for me (yeah, like I said, I occasionally am accident-prone). Never fear! I was put on stuffing duty once we realized coring apples with a knife was not my forte. Thankfully, there wasn’t really much else to do once coring was completed besides putting the fruits inside and dousing it with honey. The honey had to be warmed a bit to a liquid consistency and then poured into the apples. In hindsight, perhaps we shouldn’t have cut such a deep hole, because the honey didn’t overflow like the instructions said. Ah well. The honey was a bonus! Verdict: The flavors were certainly delicious, and having an assortment of dried fruit made it all the better! I did have a little concern with the texture, because for me, the apples were way too soft (like, almost applesauce soft), and I usually prefer my apples a bit less squishy. That said, we probably overbaked it, or put too much water in. That’s something to think about. The recipe did call for a sprinkling of heavy cream or the recipe book’s Custard Cream, but we figured we didn’t really need that. 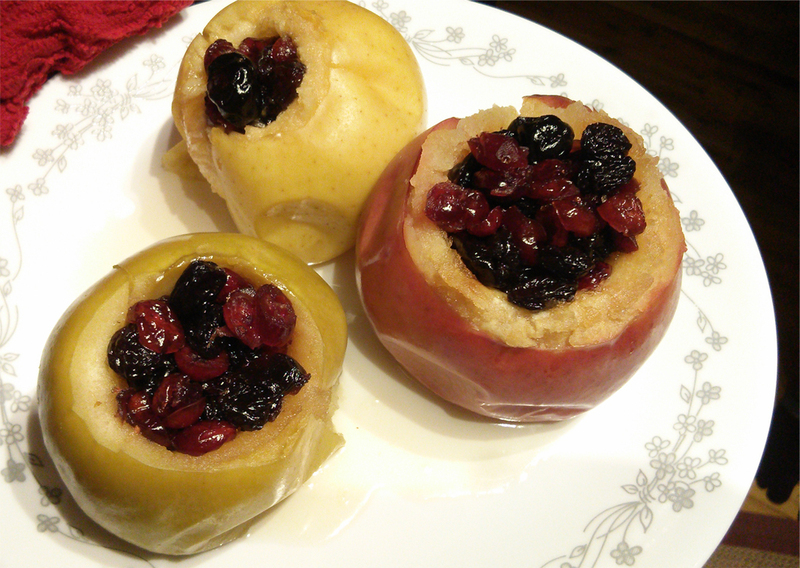 I will say that these baked apples might have gone great with ice cream. I’m thinking vanilla, butter pecan, or caramel. Nummy.